Internet censorship and surveillance as it happens "in the wild around the world" is the topic of a talk by computer security expert Jacob Appelbaum at noon on Thursday, Nov. 17 in Salazar 2016 at the Sonoma State University Computer Science Colloquium. His talk, entitled "Anonymity, Privacy, Security, Internet Surveillance, and Censorship," will include discussions of the recent Arab Spring uprisings and the NSA wiretapping of American citizens. He will also discuss practical techniques and technologies for circumvention of networked authoritarianism. 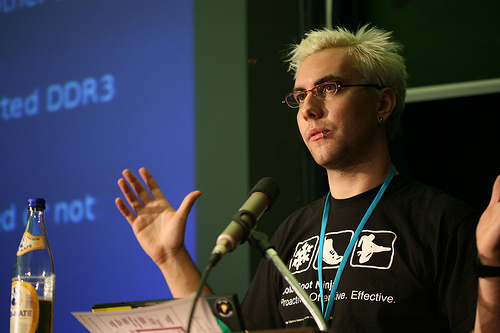 An independent computer security researcher and hacker, Appelbaum is currently employed by the University of Washington as a staff research scientist in the Department of Computer Science and Engineering. His research focuses on computer security and privacy with a specific focus in anonymity, censorship resistance, and network filtering. His association with WikiLeaks allegedly put him under Department of Justice scrutiny. The story of secret court orders, possible interception of email messages, and other cloak and dagger events involving Appelbaum brought him to the attention of the press and public. The 47th Sonoma State University Computer Science Colloquium features lectures on topics such as creating computer-generated music, the challenges of animation at Pixar, and more. Lectures are Thursdays at noon in Salazar 2016. Admission is free, parking is $5-$8 on campus.